Employers and government have various legal arrangements to cover different scenarios that affect business environments. One such arrangement is a formal arrangement negotiated for the purpose of a business entity’s recruitment of additional number of skilled workers within or outside a state. You may also see agreement templates. 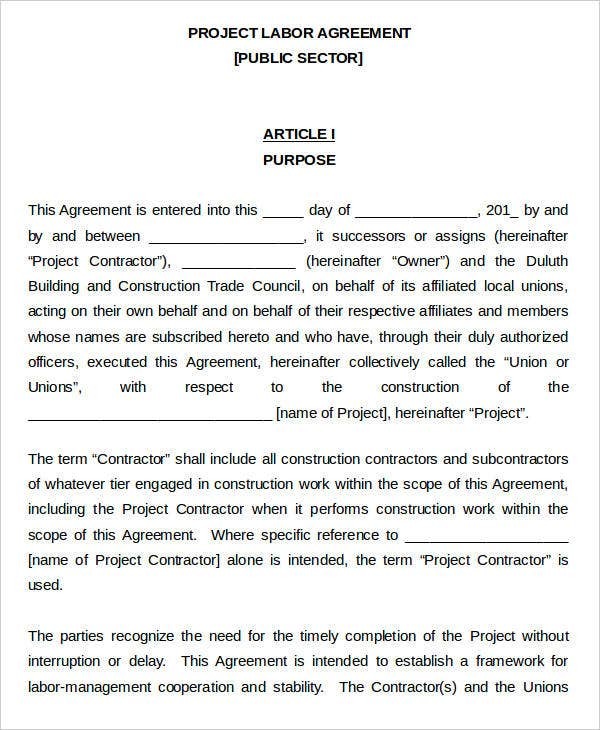 This agreement, known as a labor agreement, applies to an entity’s construction agreement with another entity which requires the skills of particular workers. In this regard, a confidentiality agreement must be stipulated for the employees’ and the entity’s protection as indicated on labor laws. 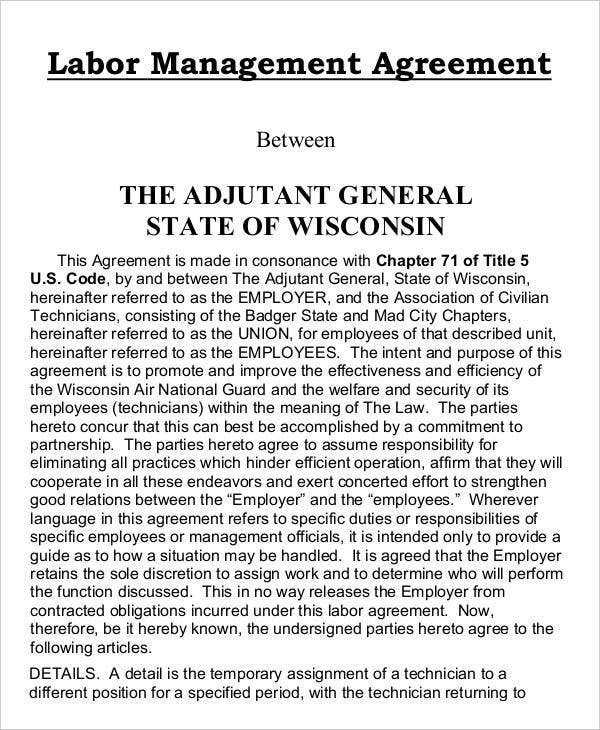 These sample labor agreement templates will give you an idea of what a labor agreement is and how it is written. 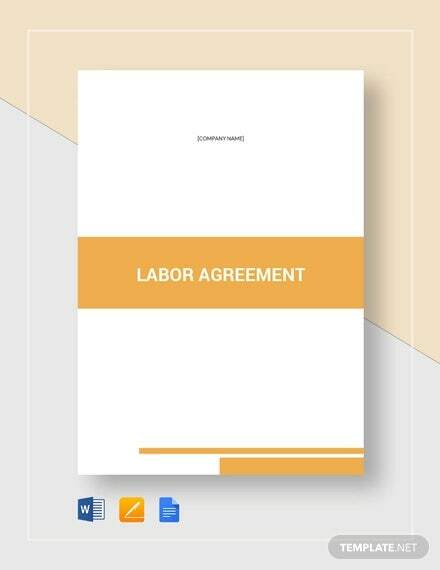 Labor agreements involve different employment points negotiated by labor unions and contractors in construction business entities. It is similar to the format presented on a sample money agreement template and a lease agreement template as they include similar elements. Amount of Salary – Priority to any worker is the information on the agreement as to how much they are going to take home pertaining to the pay and bonuses. Additional Benefits – This information pertains to what the worker will receive aside from the monetary statements like medical, rice subsidy, and pension benefits. Job Related Rights – Stipulations related to the proper implementation of employment right and procedures are presented on the labor agreement. Work Conditions – Work schedules, work environment and systems are clearly defined on the labor agreement for the workers and employers to follow. 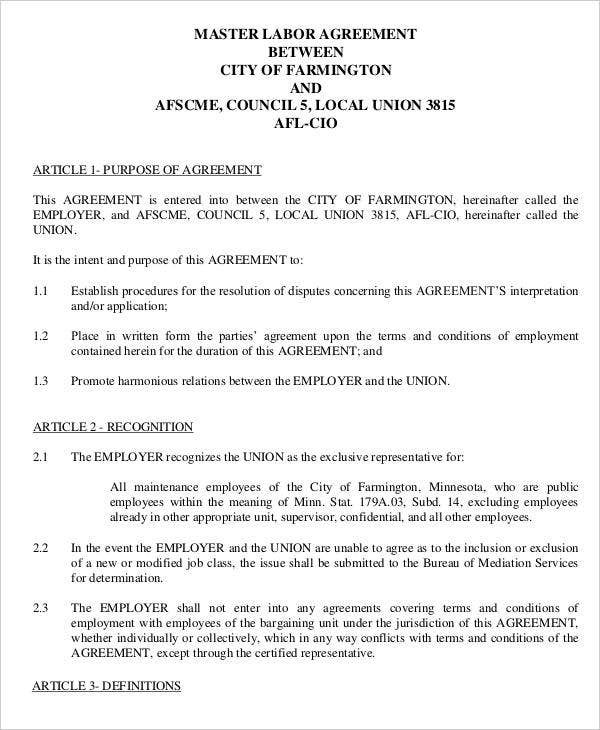 Local Labor Agreement – This type of agreement shoulders to contractors within a certain geographic area with negotiations involving local labor associations. National Labor Agreement – This agreement applies to contractors covering a wide scope of projects and number of employees providing advantages on employee wages. 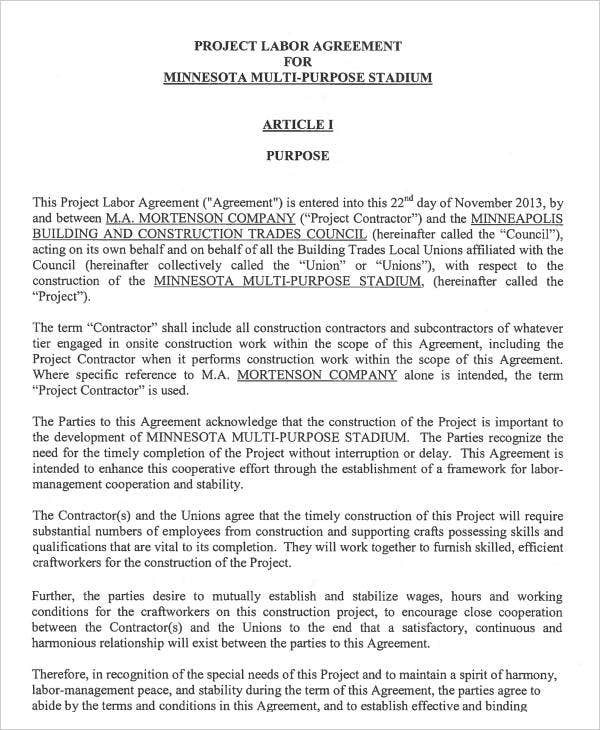 Project Labor Agreement – This type of agreement covers a specific construction project stating the terms and conditions for employees until the end of the project which is the basis as to when this agreement is terminated. Uniform terms and conditions on construction projects. Assurance in the avoidance of chaotic labor disputes. Effective certification of the workers safety due to strict implementation of procedures. Project Management done with less difficulty. Ensured quality and reliability of workers at efficient costs. Fixed costs increasing company expenses on the wages mandated by the union. Restriction on competition on employment of workers. 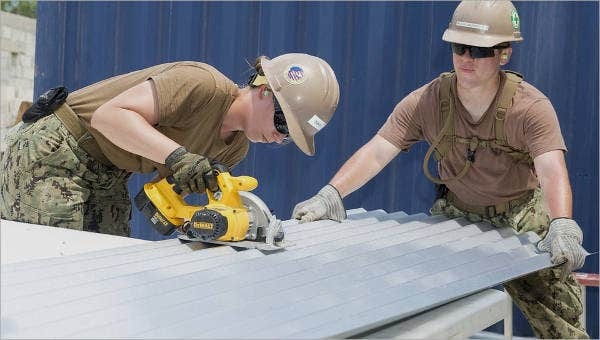 Inhibition of cost-effective contractor training programs to workers. Unnecessary mandates because of existing processes and procedures from the bidding. 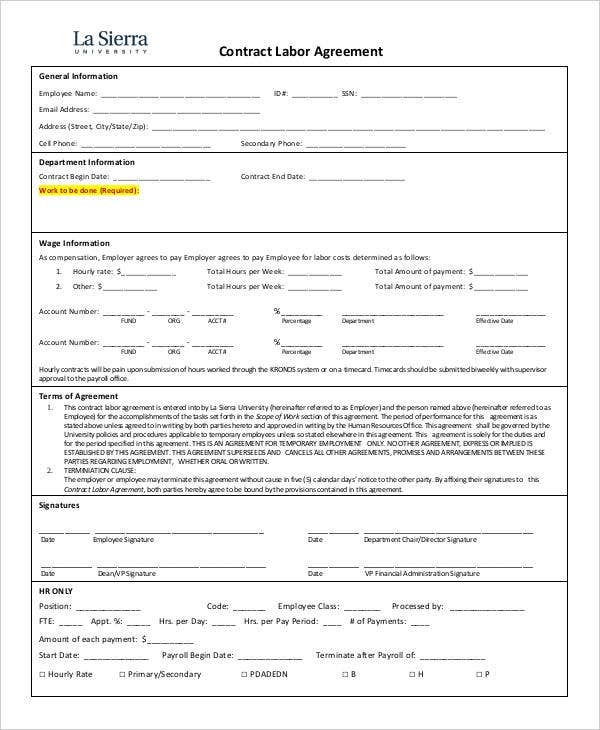 Labor agreement templates on this website form part of confidentiality agreement templates due to the classified attribute existent on the information written on the labor agreements. In this regard, labor agreements, which are formal and legal in nature, must be made with definite stipulations that would benefit both the labor associations and the construction entity in achieving a successful project.